Ginny and Pete seem to be talking past one another. Rose is concerned about the status of her family in the community, and her ownership of the farmland Larry has given her. Pete, however, seems to be talking more personally, about his love for Rose. Pete’s presence at the quarry foreshadows his death. Pete and Ginny both agree that they should be getting home soon. As they walk back to their cars, Ginny sees a snake, and Pete bumps into Ginny in the confusion. Ginny senses Pete’s solid, sweaty body. When Ginny points out the snake, Pete is oddly disinterested. Smiley hints at the sexual tension between Ginny and Pete—compare this passage with earlier passages in which Ginny thinks about Jess’s muscular body. The snake, a Biblical symbol of temptation, suggests Jess and Ginny’s sinful natures (and recalls Jess pointing out snakes to Ginny in an earlier scene). Arn, Jackson. "A Thousand Acres Book 4, Chapter 32." LitCharts. LitCharts LLC, 22 Nov 2016. Web. 19 Apr 2019. Arn, Jackson. "A Thousand Acres Book 4, Chapter 32." LitCharts LLC, November 22, 2016. 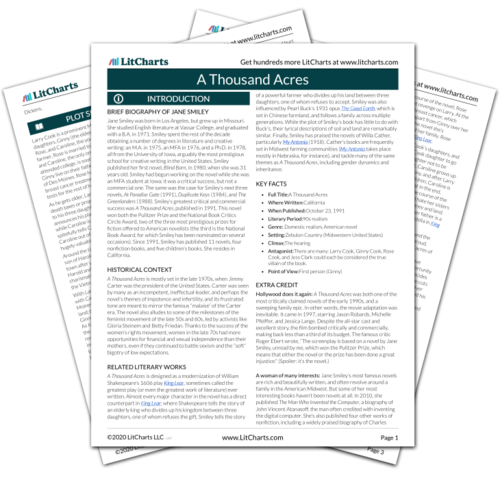 Retrieved April 19, 2019. https://www.litcharts.com/lit/a-thousand-acres/book-4-chapter-32.